Battery & Alternator @ Auto Motion Chatham Used Cars ON. The car battery provides the jolt of electricity necessary to power all the electrical components in your vehicle. … A chemical reaction puts your car in action: Your battery converts chemical energy into the electrical energy necessary to power yourcar, delivering voltage to the starter. How do you maintain a car battery? Step 1: Clean the cables. Clean corrosion from the battery. Step 2: Check the level of the electrolyte. Add water to fill holes, if necessary. Step 3: Check the condition and charge of the battery. Test the electrolyte in each cell with a hydrometer. Step 4: To drop in the new battery first remove the cables. While a battery that allows a car start at the first turn of the key is a joyful thing, it doesn’t last forever. In fact, depending on where you live and how you drive, the condition of your charging system, and a number of other factors, a battery lasts about four years on average. Can you charge a car battery while idling? Driving the car is a better option but an idling engine will charge the battery as long as you don’t have anything on. Turn off your radio, air-con, lights- everything. Modern alternators will put out 70-80 amps at 3000rpm (engine speed, not alternator) and 15-25 amps at idle. Often, it is on-board electrical equipment that drains the battery – it may seem obvious but it’s important to switch off the lights and radio etc. when you leave your car overnight and for long periods. Car batteries charge themselves whilst the vehicle is being driven, but it won’t fully charge itself during short journeys. 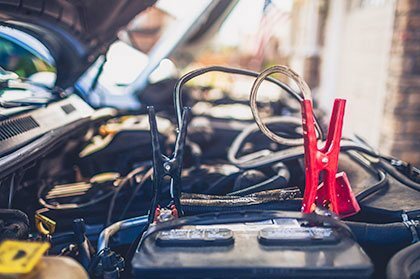 The cars alternator plays a big part in helping the battery to charge itself – but if it becomes corroded, or has a loose connection it cannot function correctly, and the battery will run flat. If you suspect there is an issue with the alternator or starter motor, you will need to consult a professional.